One of the perks of living in a city like Los Angeles is that you have a lot of opportunities to meet celebrities you may admire. So, tonight I'm going to take advantage and head over to Japan L.A.'s Christmas Party to meet Hello Kitty! Why not? It sounds silly, fun, and even a bit festive. I'm looking forward to checking out the JapanL.A. shop, which is something I've been meaning to do. Anyone else in? A few years ago there was an art exhibit called "Hello Kitty Gets a Mouth". Did you see that one? We missed it, but it sounded like fun. 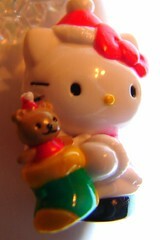 Something about Hello Kitty having no mouth was supposed to be a metaphor for women in Japan. Fun! I would so be there if I weren't 6 hours away. EEEEEEE! i wish i could! i am elsewhere tonight but take pictures for me! Give Kitty big kisses for me! do they have japanese snacks at that store? i love japanese snacks - where else can you get prawn flavored "french fries" in really cool packaging. Damn. I wanna go with you. I've seen her before though. I mean, I worked at a Hello Kitty store for years, so, you know. Giant kitty. Seen her. Cool. I'm not much for Hello Kitty stuff, but it sounds like a lot of fun.